In this industry, your headshot photo is basically your business card. Your actor headshot is an 8×10 photo that represents you and ultimately helps you get jobs. Often, it’s your only link to Casting Directors and future acting jobs — so you definitely want to do it right! How does a new actor go about getting quality headshots without getting ripped off? Many actors make the mistake of paying $500 to some overpriced and over-hyped photographer only to get a disk full of unusable shots. Here’s a tip: You don’t need to find the most expensive photographer in town to get quality shots! I’m not saying that all higher priced photographers are a waste of money. There are plenty of cases where you do get what you pay for. By doing your research and asking other actors which photographers have worked for them, you can find top-notch photographers are actually worth their photo session fee. Just make sure you find a photographer who specializes in headshots. Here’s where to get professional headshots taken near you. This brings us to your actual headshot photo — the one you will post online and have printed into 8×10’s to make hard copy submissions to Casting Directors. #1 – Make sure you look like your picture. The first rule is to make sure the photo actually looks like YOU! The biggest mistake people make is to get themselves photographed in soft studio “glamour shots style” lighting. To top it off, they get the photo retouched. They remove the blemishes, shrink their waistline, color their eyes, and then they show up at the Casting Director’s office looking nothing like their photo that was supposed to represent them. So the key is to get a headshot photo that looks good, but also is a true representation of what you really look like. #2 – Plan to bring multiple different “looks” and colors to the photo shoot. Once you find a photographer, ask them how many wardrobe changes you will be allowed. On the day of the photo shoot, bring clothing with solid colors in hues that accentuate your skin tone. Layers also tend to look great. Try to avoid small stripes, small patterns (such as paisley), and white or reflective colors. A small amount of makeup or powder works well to avoid shine or remove bags under your eyes — but avoid overdoing it! Try to bring different outfits that portray different character types. After all, if you bring a black suit, a gray suit, and a blue suit you’re basically going to have the same 3 shots with different color suits. It would be better to bring a suit, a t-shirt & jeans outfit, and a pair of jogging pants & tank top. That way, you would be getting 3 distinctly different looks. Here’s how to prepare for your actor headshots. #3 – Find out if the photographer is shooting digital or film pics. Ask your photographer beforehand if they shoot on film or digital. Nowadays, almost everyone shoots on digital. In some cases, you could leave the shoot that day with your CD of images in hand! Plus, digital files are much easier when it comes to adjusting lighting and contrast. I personally like shots that are taken outdoors in natural light. While studio lighting looks great, it often looks too staged in my opinion. Make sure that the photos you’re receiving are at least 6 megapixels and preferably in JPEG format. JPEG is the format most widely accepted by casting websites. Six megapixels should be plenty big enough for printing up your 8×10’s. More tips to help you get the best actor headshots. #4 – Take the time to choose your favorite professional headshots. After your photo shoot, you’re going to feel overwhelmed with the amount of photos that you have to choose from. Narrow it down to your 10 favorite photos. Your ultimate goal should be to end up with one commercial shot (usually smiling) and one theatrical shot (no smile). Show the top 10 to others — your spouse, boyfriend or girlfriend, family, friends, agent, or manager. Ask each of them to choose the headshot photo that they like best. You’ll notice that the same ones keep getting chosen again and again. This should guide you towards choosing those final 2 headshots that are going to represent you. Remember, in most cases, your headshot photo is your only link between you and a Casting Director or Agent. Make it a good one! Follow these tips when reviewing your actor headshots and choosing the best one. #5 – Choose the best “finish” when printing your headshot photo. Some people will go out and waste hundreds of dollars printing up actual photos for their actor headshots. The fact is, you can get glossy lithographs for one-third the price. And the best part: you can print your acting resume right on the back! Some actors have suggested that Casting Directors don’t like resumes printed on the back — because they prefer to staple your resume in 4 corners onto the back of your headshot. I say that is old school thinking. However, if you take a stack of 100 actor headshots that have had the resume stapled on the back and you take a stack of headshots that have been printed on instead, you will immediately notice the difference. The stapled stack is all curved in the middle and about 4 inches thick. The printed stack is about 1 inch thick and nice and neat. 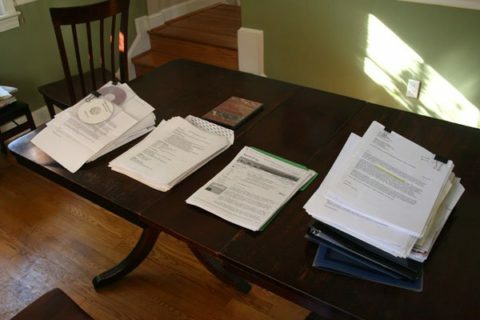 Why would a Casting Director want to take up more room than necessary in their files? Lord knows they have enough stacks of actor headshots piling up — they surely could use more office space! Fortunately for them, we are almost at the day of 100% electronic submissions. Here are some excellent professional headshot tips for actors! #6 – Think about the colors and borders for your actor headshots. If, for some reason you’re still using black & white headshots, I would strongly recommend that you switch to color headshots. I personally think that color headshots have come to be expected by most Casting Directors. The second recommendation is that you make a color border. This is the type of thing that can separate you from all the other sheep in the crowd. Try to be different! Surely, when a Casting Director is thumbing through hundreds of actor headshots, they will stop at one with a color border — regardless of whether or not the actor is right for the role. Can’t you just picture a Casting Director sorting through the pile of headshots? They would be seeing different borders… white, white, white, black, white, white, GREEN! You must realize that this fact alone is not going to get you cast on someone’s project, but it is going to get you noticed! Even if they don’t have a role for you right now, they might put your headshot photo aside for future projects. This is the type of thinking that will help you get ahead in Hollywood or anywhere you may be trying to succeed! Now, let’s move on to the actor’s resume. Your goal should be to have a nice, neat, clean format and to fit everything onto 1 page. In the top righthand corner of the page should be your Manager’s information (if you have one). You can place your name in large bold print just below this at the top of the page. Next, list any union affiliations (SAG / AFTRA / AEA). TIP: If you are not a member SAG, then do not put SAG on your headshot. This is a surefire way to upset a Casting Director or production company. If you audition for a SAG role and they find out that you are non-union and you book the job, you’ll be causing lots of headaches and you might not be asked back to that Casting office again. Just below that, put your height, weight, hair color, and eye color. DON’T include your age or your personal address! When it comes to credits, it’s okay to “bend the truth” but make sure your credits are legitimate. Don’t use background work as credits or make up imaginary credits — but any role you may have had (paid or not) can be considered a credit. Plays, student films, independent films all can be used as credits. You’ll want to separate your credits into different categories: Film, Television, Theatre, Commercials, Training and Skills. Don’t worry — it takes time to build up your professional acting resume. Most beginning actors have resumes that are nearly empty when they move to Los Angeles. Whatever you do, don’t lie on your acting resume! The most important thing is to make sure you have all the necessary contact information listed on your headshot photo and your acting resume. Have your personal phone number, your email address, and your Agent’s logo and phone number. The more ways the Casting Director has to get in touch with you the better! TIP: Some Agents will ask that you don’t use your personal contact info and that you only put the Agent’s contact info. This is a way to insure that the Agent is the only liaison between you and the Casting Director. Also, many actors now include their personal website URL along with a note that the Casting Director can view their demo reel on this website. This saves you from having to mail out demo reel DVDs to each Casting Director. Instead, all they have to do is go to your website and click on “Demo Reel” to see it. This way, they can immediately decide if you’re right for their project. Now that you’re armed with an arsenal of knowledge about actor headshots and acting resumes, spend some time online perusing through the various headshot photographers in your area. Don’t be scared to call and ask questions about your photo shoot. Try to find a photographer who is willing to shoot until they get the results you desire. But most of all – have fun!